Most know the heroic tales of the adult Jedi Master, Qui-Gon Jinn. We know that he mentored the even more famous Obi-Wan Kenobi and recent tales have shown that he was instrumental in putting the youthful Anakin Skywalker on his path. Okay… perhaps that last bit wasn’t the most heroic of his tales, but one can never know what might have occurred if Master Jinn had remained with us to see Anakin trained in a more balanced manner! What is lesser known is the miraculous powers that he exhibited, too, as a child. His deft skill with the lightsaber and early attunement to the Living Force. At a younger age than most, he was set to become a padawan of the illustrious Count Dooku. Er… well, I suppose that didn’t turn out too stellar, either, down the road. He was even warned not to care too strongly for living things lest they betray him. But, if anyone was going to have a character flaw, having faith in the good of people is certainly the one to have! What other secrets might be uncovered in an exploration of Qui-Gon Jinn’s past!? 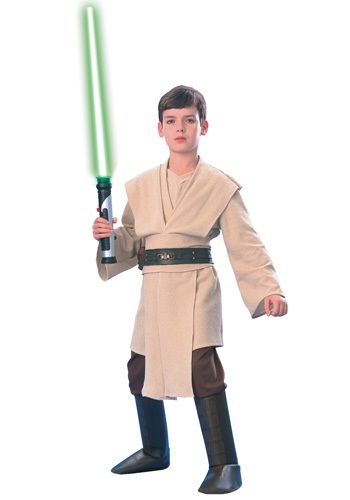 You and your own youngling can dive into that history and bring it to the light side, though, with this Super Deluxe Child Qui-Gon Jinn costume. The tan tunic and shoulder drapes are comfortable and immediately call to attention the ancient history of the Jedi Council. A fabric sash complements the brown elastic pants to complete the outfit. It might be early for a youngling, but Qui-Gon is exceptionally skilled, so equip the green crystal lightsaber and your youngling will be ready to take an even better path in this incarnation!